Affectionate, playful, and super intelligent, the beautiful Golden Retriever is popular all over the world. Their gentle nature and eagerness to please makes them an outstanding family dog. Weighing in at around 55-75 pounds, these big dogs do require lots of daily activity. They are perfect for any home where they can have some room to run or an owner that is dedicated to providing them with plenty of exercise. Golden Retrievers are also great with children. Their golden color can be various shades but it is always golden. Our choice for the best food to feed your Golden Retriever. Four other very good dog foods for your Golden. How we chose these foods. The dietary needs of Golden Retrievers. Special nutritional requirements for Goldens. How much and how often you should feed your dog. And, food allergies and food sensitivities in Golden Retrievers. Sit back and we’ll get started. How much should you feed your Golden? Do Goldens have food allergies or food sensitivities? If you have been skeptical about breed-specific dog foods, it’s time to put aside your skepticism, especially where Golden Retrievers are concerned. 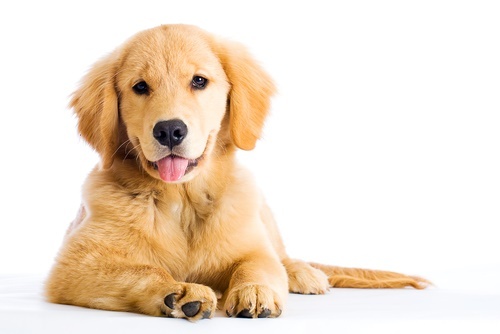 Goldens are one of the breeds that have been particularly sensitive to taurine in dog food and to ingredients in some grain free foods that might be blocking the absorption of taurine in the dog’s body. Veterinarians have reported seeing many Golden Retrievers with heart problems, especially dilated cardiomyopathy (DCM). 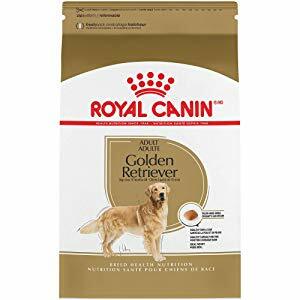 Changing the dog’s diet to a food such as Royal Canin Golden Retriever Adult dry dog food has been recommended by many veterinary cardiologists with good results (though results depend on many factors). This food is designed for Golden Retrievers over 15 months of age. The kibble size, shape, and texture are formulated to encourage your Golden to chew the food better. It helps maintains the dog’s healthy skin and coat with EPA and DHA. It also contains nutrients, such as taurine, to support healthy cardiac function. This is not a grain free food so it doesn’t contain the ingredients which have been suspected of blocking taurine absorption. If you think that your Golden Retriever could have any heart problems, we recommend that you talk to your veterinarian about testing. The U.S. Food and Drug Administration (FDA) recently put out a warning about dog foods containing peas, legumes, lentils, and root vegetables such as potatoes and sweet potatoes. These are the alternative ingredients that are often used in grain free dog foods. An unusually high number of dogs eating grain free foods have been reported to have dilated cardiomyopathy (DCM), a serious heart problem. Many (but not all) of these dogs have also been found to have low levels of the amino acid taurine. 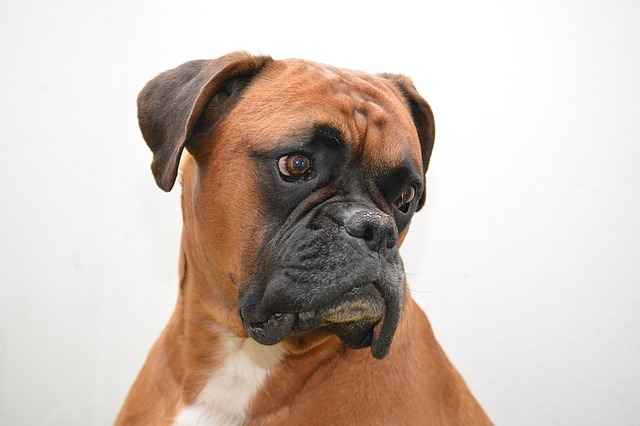 DCM is a genetic condition in a few breeds but it is now being identified as a possibly diet-related problem in other dogs. The FDA is working with veterinary cardiologists and dog owners to research this problem. In the mean time, it is recommended that owners steer clear of foods that contain these suspect ingredients in large amounts (such as the first five ingredients). Dogs that have the diet-related form of DCM can often improve if their diet is changed. We have used this criteria in choosing foods for Golden Retrievers. Golden Retrievers, in particular, have been identified as one of the breeds that is being diagnosed more often with dilated cardiomyopathy in recent years. One of the chief researchers looking at the problems with taurine, grain free dog foods, and heart problems in dogs – Dr. Josh Stern – is a Golden Retriever owner. Every dog needs to have good quality, digestible protein in his diet. The protein should come from animal sources such as meat, fish, and poultry. Per AAFCO (the Association of American Feed Control Officials), adult dogs need a minimum of 18 percent protein in their diet. Puppies and pregnant/lactating females need a minimum of 22 percent protein. If your Golden Retriever is very active and engaging in activities such as agility or hunting, he would need more protein. Golden Retrievers are not considered quite the chow hounds that their cousins Labrador Retrievers are but they still enjoy their food quite a bit. With many Goldens it is important to watch their weight, especially as they get older and become less active. A young adult Golden Retriever weighing 75 pounds typically needs about 1778 calories per day. A neutered or very sedentary dog might require slightly fewer calories. If your dog is extremely active or engaging in serious work such as hunting you will need to increase his calories. Regular exercise throughout his lifetime is good for your Golden even in his senior years. As with many large dogs, some Golden Retrievers can have issues with hip and elbow dysplasia or arthritis. Inactivity and weight gain will worsen these conditions. Carrying extra weight makes any joint problems worse. Staying active and trim can help your older dog feel better and lengthen his life. It’s estimated that about 18.7 percent of Golden Retrievers die from hemangiosarcoma (a cancer), usually when they are 10 years or older. One of the healthiest things that any of us can do for our dogs is to grow our puppies slowly by strictly limiting food intake, and to keep our dogs very trim throughout their lives. 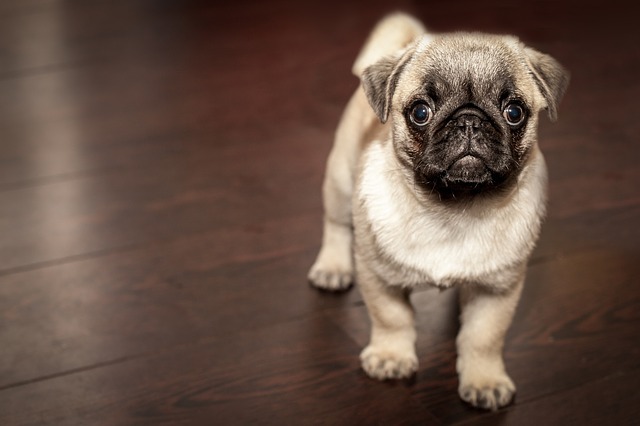 Slowly grown puppies, kept trim as adults, showed significantly reduced rates of cancer, and an older age of onset of cancer, as compared to their littermates that served as a control group (Kealy et al, 2002). Overall, the trim dogs enjoyed a median life span that was 22 months longer than the littermates. In addition, the food-restricted dogs had lower rates of osteoarthritis, liver disease, and false pregnancies than did their pair-mates. 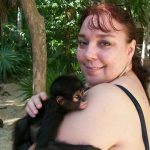 Restricted food studies have shown similar results in a variety of other animals including mice and rats, and preliminary results in rhesus monkeys. We hope you will take this to heart and try to keep your Golden Retriever slim throughout his lifetime. Cancer is only one problem that is more likely in overweight dogs. Diabetes, joint/orthopedic problems, respiratory problems, heart problems, and other health issues can also occur in dogs that are overweight or obese. All of these things can shorten your dog’s life. If your dog is spayed or neutered s/he will likely have a slower than normal metabolism so take this into account when you are feeding. Spayed or neutered dogs usually need slightly fewer calories so they won’t gain too much weight. Unless your dog is engaged in strenuous athletic activity you should choose a food that isn’t too high in fat. Adult dogs need a minimum of 5 percent fat in their diet but nearly all dog foods today have a much higher fat percentage. If your dog is inactive, it’s especially important to watch the fat percentage. If you feed your couch potato dog a performance dog food with 20 percent fat you will simply be loading him up with pounds of fat that he doesn’t need – and possibly cutting short his life. It’s a good idea to measure your Golden’s food portions so he doesn’t overeat. Free feeding or leaving food sitting out all the time only encourages your dog to nibble all day and put on pounds. Most dogs will keep eating as long as there is food in a bowl. You should also watch how many treats you give your Golden. Treats shouldn’t make up more than about 15 percent of your dog’s daily calories. Many treats contain lots more calories than you would ever guess, so take it easy with them. All of the foods suggested here have been producing good results in dogs that have had their taurine levels tested and had echocardiograms done for dilated cardiomyopathy. They are made by larger companies that have veterinary nutritionists on staff and which do rigorous quality control. High levels of protein for lean muscles. Added calcium for strong bones. Omega 6 and 3 fatty acids for healthy skin and coat. This food contains maize and wheat which some people won’t like. 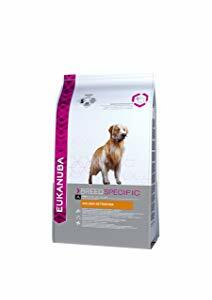 Another breed-specific formula made just for Golden Retrievers, Eukanuba Adult Dry Dog Food for Golden Retrievers is formulated with high levels of protein for lean muscles and optimal body condition. It has added calcium for strong bones. And it contributes to a healthy skin and radiant coat with omega 6 and 3 fatty acids. 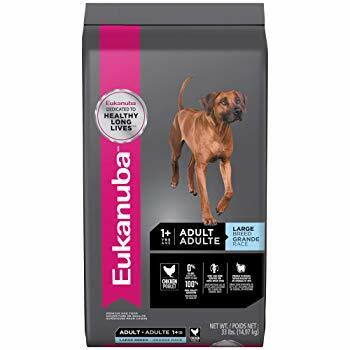 Eukanuba works with vets and top breeders to design foods so dogs will have long, healthy lives. This food also has prebiotics for optimal digestion and antioxidants for a strong immune system. DentaDefense keeps teeth clean and healthy. Dried chicken and turkey are the first ingredients. Purina employs veterinary nutritionists to formulate their foods. The company has outstanding quality control measures. This food contains wheat, corn, and animal ingredients that some people will not like. Some people do not like the Purina company or any of its products. 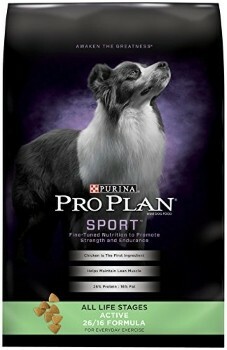 Purina Pro Plan Sport All Life Stages Active 26/16 formula is designed for active dogs. It doesn’t have as much fat or as many calories as the 30/20 formula but it provides more than enough energy for most dogs to run and play. It has high quality protein with chicken as the first ingredient to maintain lean muscle and keep your dog in ideal condition. High quality sources of carbohydrates provide good energy. Rich antioxidants support a healthy immune system. The formula is easily digestible so your dog gets all of the nutrients. Suitable for growing puppies, adults, and senior dogs. The company’s facilities have superior quality control. This food contains corn and chicken by-product meal which some people will not like. The low-grain formulas have been difficult to get recently but the company says they are increasing production. 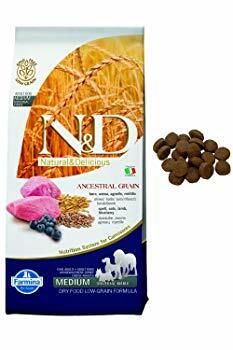 Farmina N & D Ancestral Low Grain Dry Dog Food has been little-known in the United States until recently but we have found this low-grain food to be excellent. We particularly like the cod formula but all of the low grain formulas are very good. This food is made in Italy and the company works with the Chair of Animal Nutrition at the University of Naples to formulate the food. It is comprised of 60 percent high quality animal ingredients, 20 percent organic spelt and organic oats, and 20 percent vegetables, fruits, vitamins, and minerals. Farmina has become in demand in the United States recently because of the warning from the U.S. Food and Drug Administration about the possible link between grain-free dog foods and dilated cardiomyopathy in dogs. Farmina ancestral low grain dog foods are one of the brands that have been performing very well when dog taurine levels were tested. Golden Retrievers are usually very active, especially as puppies and young adults. Young dogs will need plenty of calories. This is especially true if you intend to do things together such as agility, rally, playing frisbee, hiking, or one of the fifty other things that Golden Retrievers love to do with their people. As your dog gets older it’s natural that he will start to slow down. If he begins to look a little pudgy at this time, you can cut back on his portions a little or consider changing foods to a dog food made for mature adult dogs. These foods typically have slightly fewer calories but still let a dog feel full. Remember that your Golden will stay healthier throughout his lifetime if you keep him active, even when he’s older. Daily walks are great and so are regular runs. Golden Retrievers are a large breed but not all Goldens will grow to be over 70 pounds. This is technically the cut-off point for “large-size” dogs, according to AAFCO and pet food companies. The reason this matters is that when you buy puppy food it could be designated for regular puppies (under 70 pounds) or for large breed puppies (over 70 pounds). All of this is done to encourage these big puppies to grow more slowly so they won’t shoot up in size too fast – and then crumple. 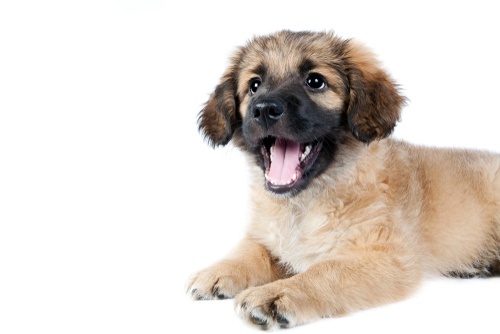 Puppies that are not considered to be “large-size” eat regular puppy food. So, which puppy food should you get for your Golden Retriever puppy? You should make this decision on a puppy-by-puppy basis. If you have a puppy that looks like he’s going to be a whopper, choose the large breed puppy food. If you have a smaller puppy, get the regular puppy food. Female Golden Retrievers are more likely to be on the smaller side, if that helps. Also, the bigger your puppy, the longer you should plan on feeding him or her a puppy food. If you have a large puppy that’s eating a large breed puppy food, it’s not unusual to continue feeding this kind of food until your puppy is about 14-15 months old. A 60-pound puppy eating regular puppy food may transition to an adult food by the time she’s 12 months old. If you would like things to be less complicated, you could simply feed your Golden Retriever puppy a large breed puppy food, regardless of size. Since Goldens can have some issues with hip and elbow dysplasia, this probably wouldn’t hurt. The important thing is to keep your puppy slim and encourage slow growth, regardless of the food you feed. As long as you are feeding a food that is complete and balanced, you should not have to add any supplements or nutrients to your Golden puppy’s food. Most adult Golden Retrievers need between 20 and 30 calories per day, per pound. So, if your Golden weighs 70 pounds, you should probably be feeding him or her about 1750 calories per day. You can divide these calories up into a couple of meals – one in the morning and one in the evening. Kibble varies in calories but most kibble is about 350 calories per cup. That’s only an estimate. Some kibble can have just 270 calories per cup (or less!) and other kibble can have nearly 500 calories per cup. You can usually find the calorie information on the bag. If not, check the company web site. Pet food manufacturers are required to provide calorie information now but some companies are still slow to comply. Instead of figuring calories, many people prefer to follow the feeding suggestions provided on the label of the dog food bag. These suggestions are based on the calories in the dog food. You can adjust the amount if you see your dog gaining or losing weight. For a healthy Golden Retriever, you should be able to feel but not see his ribs. He should have a “tuck up” or waist behind his ribs. He should have good energy and clear eyes. His skin and coat should be in good condition. If you are changing your dog’s food, remember to make changes gradually so you won’t upset your dog’s stomach. And, of course, keep fresh water available at all times. Golden Retrievers are usually easy to maintain. If your dog is losing weight and you haven’t changed his portions, talk to your veterinarian. Any dog can develop an allergy. We didn’t find any information to suggest that Golden Retrievers are more prone to food allergies or sensitivities than other dogs but they can occur. If your dog has a food allergy or food sensitivity it’s a good idea to work with your veterinarian to identify your dog’s food triggers. In the long run, that’s usually faster and less expensive than trying to figure it out by trial and error yourself. You and your veterinarian can put your dog on an elimination diet to figure out which ingredients are causing your dog problems. After you ave identified the specific ingredients you can select a food that should work for your dog. Depending on the trigger ingredient(s), you might need a hypoallergenic or prescription dog food or you may be able to buy the food you need – minus the bad ingredient – online or in a pet store. Golden Retrievers can have a skin condition called ichthyosis which is seldom severe. It looks like fish scales and it’s the result of a mutation. It’s specific to Golden Retrievers. 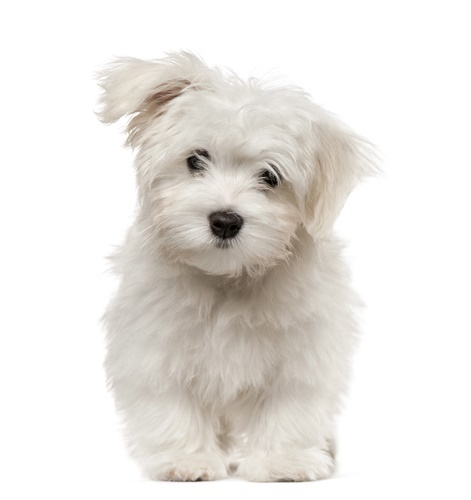 Breeders sometimes call it “puppy dandruff” and puppies usually outgrow the flaky skin as they get older, though it can occur in adult dogs. It’s not an allergy and it’s not contagious.